Past The Shallows is a deep yet simplistically written book. I knew after the first few pages that it was my kind of novel. It is equal parts a novel of family dynamics and a love story to the ocean. Past The Shallows follows three brothers Joe, Harry and Miles exploring their relationship with one another and with their alcoholic fisherman father. The story is an intricate examination of their family dynamics years after the death of their mother. My two favorite characters were Miles and Harry. Joe following the death of his grandfather is trying to leave the island and isn’t as large a part of the story as these two. I loved the relationship between teenage Miles and his elementary school age brother Harry. How they looked after and cared for one another was really moving. The real highlight of this novel was the setting in Tasmania. The descriptions of the ocean, fishing, surfing, and the beach were very well written and pulled me in to this place. I could feel the surf spray and the rocking of the boat. Parrett’s writing is really wonderful especially given its simplistic nature. The sentences tend to be short and the descriptions aren’t sweeping or overly broad. The writing only tells you what you need to know and in the end all the information given is important. I liked this quality of the story. 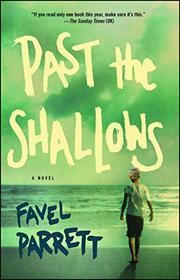 Overall, Past the Shallows was a moving novel with a sweeping setting and heartbreaking moments. It isn’t a young adult novel but rather literature but I believe it will appeal to YA readers looking for a well written and deep story. I, much like the characters in this novel, have always lived near and loved the ocean. I have an entire spotify playlist dedicated to songs that remind me of the ocean. I would recommend listening to this playlist while reading Past The Shallows.